Roots and leaves, sometimes flowers and/or fresh plant. Only the fresh plant is poisonous and effective medicinally. Erect annual or perennial, 2-3 feet tall. Leaves palmately divided into 5-7 stalkless, lance-shaped, toothed segments. Flowers are shiny; golden yellow within, lighter outside; blooms May to September. Fruits are flat, smooth, with distinct margins. 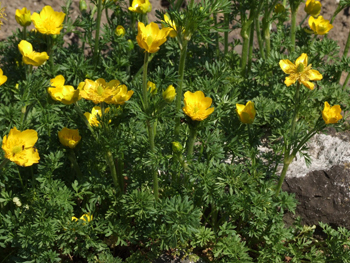 Bulbous buttercup is a perennial plant. The hairy stem grows 6-8 inches high above the ground and swells out into a solid, fleshy bulb, or corm, under the ground. Small, fibrous roots grow from the bottom of the bulb. The long-petioled basal leaves are three-parted, with the leaflets three-lobed. The upper leaves are pinnate, with narrow leaflets. 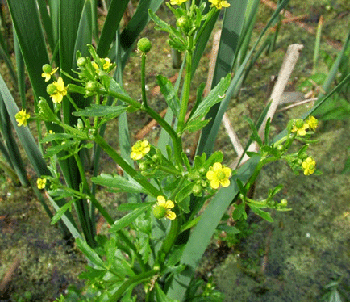 Several golden-yellow flowers appear on each stem from May to July. An annual or biennial plant, the fibrous root sends a stiff, hollow, glabrous, branched stem to a height of 6-18 inches. The leaves are thick, light green, shiny, and palmately lobed. Pale yellow flowers appear between May and November. Ranunculus acris: found in fields throughout the U.S. but mostly absent from the prairies. Ranunculus bulbosus: found in fields, pastures, and dry meadows of the northeastern U.S. and some Pacific coastal areas. Marsh crowfoot is found in wet, marshy places in the northern U.S., the western coastal states, and Canada. 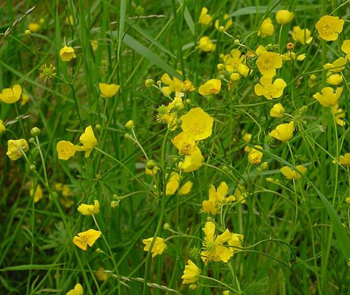 There are 250 species of buttercup that are native in cold climates throughout the Untied States and Europe. Fresh leaves historically used as external rubefacient in rheumatism, gout, arthritis, neuralgia (topically or externally applied). American Indians poulticed root for eczema, warts, boils or abscesses. Action based on irritating affected part. It is directly applied to warts. A tincture may be both externally applied or taken internally to treat shingles and sciatica. Extremely acrid, causing intense pain and burning of mouth, mucous membranes; blisters skin. External application may cause blisters and lead to ulceration with prolonged use. Internal overdose may cause gastroenteritis. Avoid use. Similar warning applies to other buttercups, and many other plants in the buttercup family. Marsh crowfoot is the most active of the three buttercup species; mere contact with the skin can cause irritation and blistering. Do not use internally. Do not use without medical supervision.